The following viewpoints are not necessarily those of the University of Detroit Mercy or that of the employees of the university or library. I thought I better put that disclaimer in just in case-I don’t want anyone to think that any political bias that might get expressed here reflects on anyone but me. 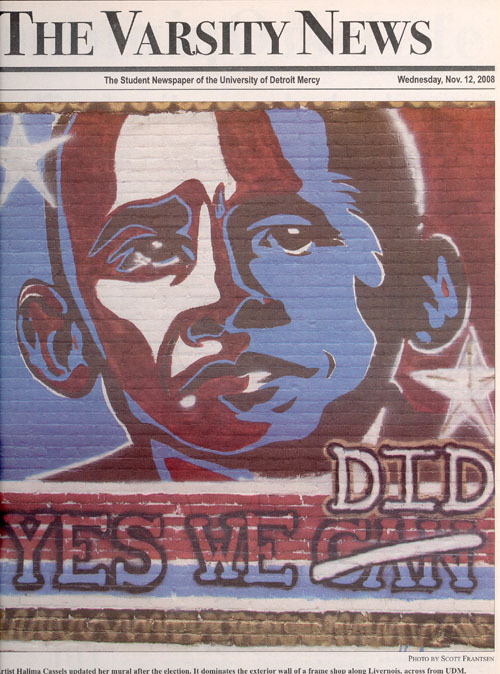 While college students came out in significant numbers to support the election of President Obama in 2008 and 2012, that seems to be more the exception than the rule when it come to college students role in presidential elections in the past. Clinton does not seem to be inspiring the students to vote for her and Trump might be discouraging students not to vote at all. 1964-Johnson vs Goldwater: UD held a mock election. Johnson (Democrat) won 501-301. There was also a Michigan governors race that year, Romney (Republican) won over Neil Steabler 608-169. Must have been a lot of ticket splitters that year. 1968-Nixon vs Humphrey vs Wallace: If it were not for a big front page article on October 29th issue, on a visit by Humphrey’s wife Muriel to the Detroit area, you might not even know that it was an election year! 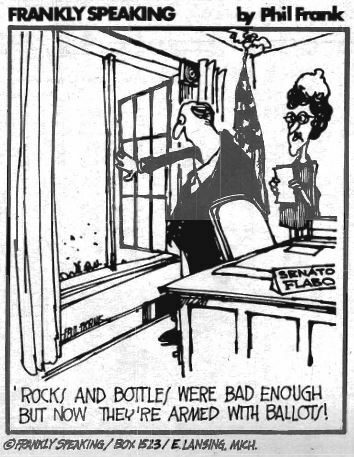 1972-Nixon vs McGovern: At least in this year, the Varsity news ran quite a few political items to inform the students of the positions of the presidential candidates. It was the first national election that 18-year-olds were given the right to vote by the 26th Amendment. Not surprising with the conflict still going on in Vietnam, the student newspaper endorsed McGovern for president. 1976-Carter vs Ford vs McCarthy: Wish I could tell you, but we have no Varsity News for the 76-77 school year. If you have any, send them to us! 1984 and 1988 election coverage by the student newspaper seem pretty routine with articles about the candidates and their positions. 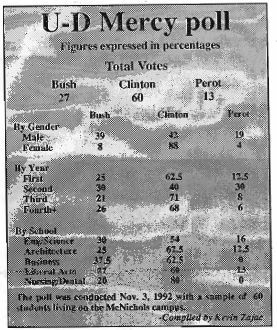 1992-Clinton vs Bush vs Perot: Most of the articles were very much like previous years, but they did publish a Detroit Mercy poll of the students. Interesting how Clinton is such an overwhelming favorite of the female students. Bush and Perot never had a chance. Anyone want to make any guesses on how the women will vote this year? The remaining election years reported in the Varsity News have the usual articles you would find in a newspaper. Would have liked more polls of the students to see how it might match the vote with the rest of the nation. Whatever your political leanings might be, I hope you will go out and vote.